(CNN)–Snoop Lion, as Snoop Dogg now calls himself, has thrown his fans a curveball. The popular West Coast rapper has taken himself from ‘thug’ life to ‘Rasta’ life. His new image isn’t the only thing that has changed. His latest song "La La La," produced by Major Lazer, has garnered plenty of attention for its reggae sound. Here's a look at some of comments and conversation around the piece. 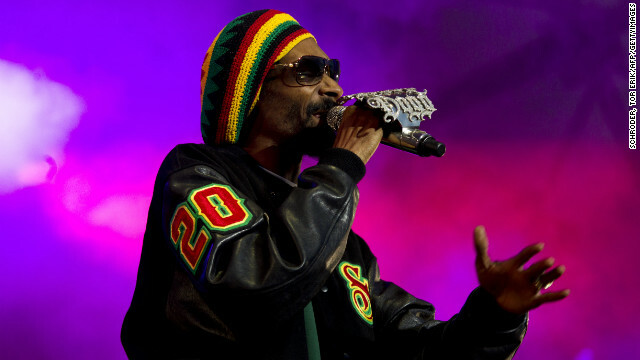 Many can hear Snoop Lion’s attempt to emulate legendary artist Bob Marley in music. Now they can see similarities in their lifestyles and beliefs. So far, 823 commenters have chimed in and plenty more chirped in on Twitter in response to our post. This reader is critical of Snoop Lion’s transition to Rastafari. His theory is that Snoop is trying to make his lifestyle justifiable in society using the religion. Snoop Dogg hasn't found religion...he's found a lifestyle justifying his "habit"...he's kept half his name and his pot....this is a joke. Another reader chimed in that he hopes Snoop is taking the move seriously. It is my hope that Yah will use Rasta as a means to Draw Snoop Lion closer to himself and the truth of Yah’s word thru the Messiah Yeshua. Karl Grzeszczack was in shock after reading the news about Snoop Lion. He says he wants to hear more Snoop Dogg and less Snoop Lion, a popular sentiment from commenters, too. In a recent tweet, the Mediafly engineer said he has gotten accustomed to Snoop Lion in his element and fears that he may not be able to follow Snoop’s transition to Marley’s genre. The music group Last Day of Sun used an analogy to express their confusion in a tweet. @Gibbswich, along with many other commenters, urged others not to take the move too seriously, calling Snoop Lion’s name change a great marketing tactic. This commenter says he agrees with @Gibbswich. He says he will start believing that Snoop Lion is a changed man once he stops being materialistic. Snoop is not stupid. This is all about getting his name back out there. I am from the Caribbean and Rastafarianism is not a hair style it's a belief. So all the red, yellow and green is not needed to identify his so call belief. When he truly starts living like a Rasta (No worldly possessions) I would start to believe that he has changed. At this time he is just exploiting the religion like a lot of so call “Rastas”. In a tweet, poker player Faraz Jaka says he initially thought Snoop Lion’s name change was “silly at first,” but he’s now looking forward to the new sound. Many were fixated on one aspect of Rastafari: smoking the "wisdom weed," or marijuana, for thinking purposes. This reader thinks weed is responsible for his Snoop Lion’s sudden epiphany, although the rapper revealed in a news conference on Monday that he got his new name in a temple from a high priest. That must be a pretty potent weed – that enables you to go from dog to lion..
Another commenter defended Snoop Lion’s usage of weed, drawing from the same theological reference point as many Rastas. She encourages people to leave Snoop be. This commenter encourages Christians to start smoking ganja to become more like Snoop Lion. Hey christians, maybe if you try a little ganja you may be enlightened, too. But another reader fired back. He warned saywhat not to categorize all Christians and even confessed his love for marijuana. @saywhat – careful my man, don't lump everyone into a category. I'm a Christian and love the green. when you stereotype you're just as bad as the hypocrites who stereotype. Snoop Lion debuts his new sound Friday night at the Hoxton in Toronto. The comments are open here too. It's not too late to chime in. In ancient civilizations, women's hair was often elaborately and carefully dressed in special ways. Women coloured their hair, curled it, and pinned it up in a variety of ways. They set their hair in waves and curls using wet clay, which they dried in the sun and then combed out, or else by using a jelly made of quince seeds soaked in water, or curling tongs and curling irons of various kinds. first i would like to say for all those who diss reggae chill out. hip hop is from reggae sorry to say it's history. next things rastafari is the true way of good life. no evil or hate. i have a feeling snoop wants to change because he sold his soul to be in this music. this just may be the only way for him to clean his spirit. most music out there is evil and gives praises to the devil. so i home snoop lion can help the black race in jamaica and around the world. we need better music for our children and our minds.